I’ve been struggling with the fact that the holidays are already upon us - it seems like it was just yesterday that we were enjoying the long warm days of summer and the evening light that lasted until well past 8PM. Now, as I write this, all the lights are on in the house and it is only 4:30PM - lists consist of holiday to-do’s, gifts to buy, and travel plans to solidify. What is even crazier is that it is that magical time of year when Williams-Sonoma releases their limited edition Peppermint Bark. 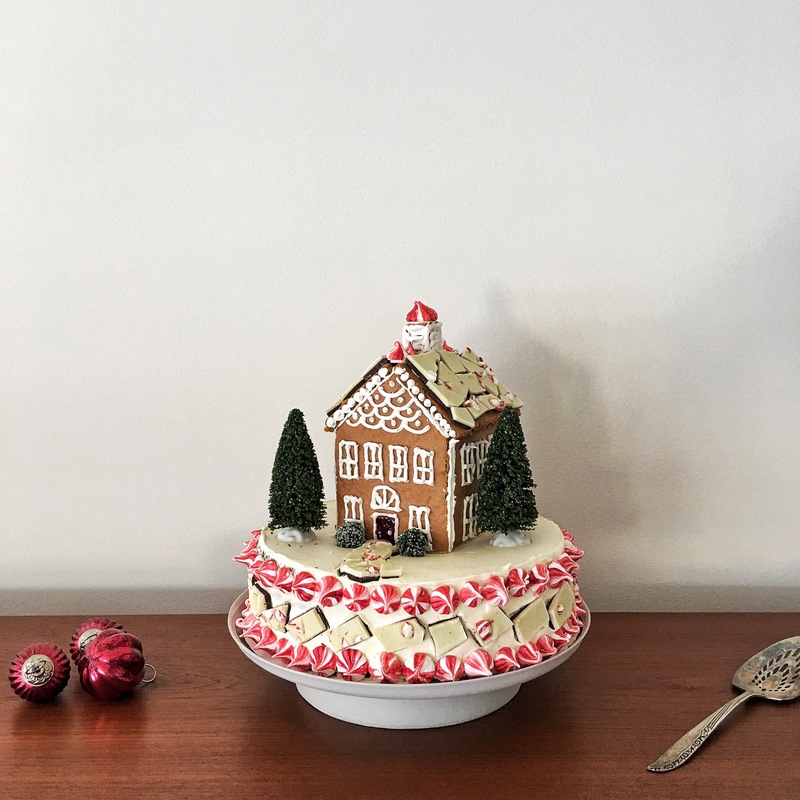 This time of year always makes me sentimental - and Williams-Sonoma #BarkYeah was my first campaign with TheFeedFeed back in 2015 - little did I know that one year later I would be writing this post after touching so many various efforts that we have been doing here - and continuing to work with our valued partner, Williams-Sonoma. I decided that this year, my recipe would be about accomplishing something crazy in the kitchen - something that takes a few days to make, and goes really well with holiday music on full blast. I’ve never made a Gingerbread House before, and I have to say, I am pretty darn pleased with how it turned out. The gingerbread has all the gingery punch with just a hint of maltiness from the Malted Barley Syrup. It is all held together with a simple royal icing and gilded like a lily with Williams-Sonoma Peppermint Bark. To create a base for the house, I used a simple chocolate cake recipe and a fluffy vanilla buttercream frosting. It is one of those projects that when you are done, you will have a wonderful, showstopping centerpiece for your holiday buffet. 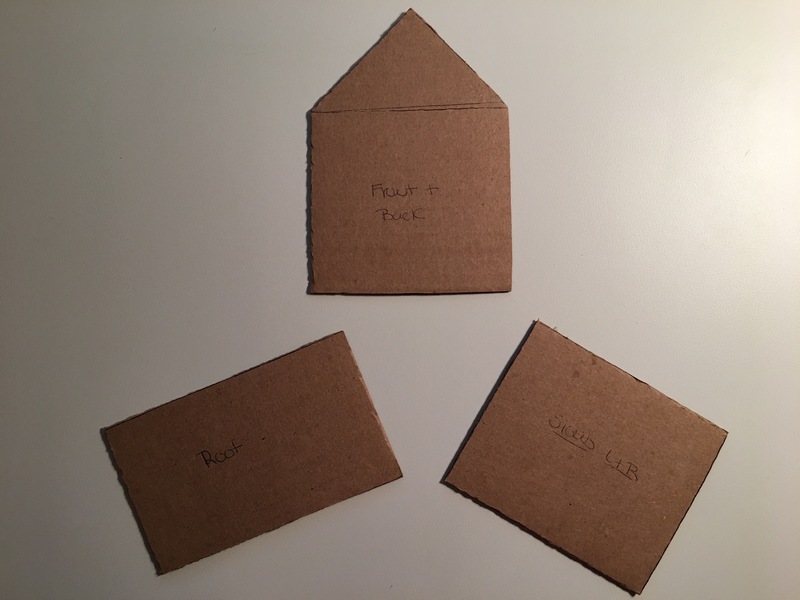 It is also a great project to get the kids involved with! Whisk flour, baking soda, salt and spices in a large bowl & set aside. Beat butter and brown sugar with an electric mixer on medium speed until fluffy - add eggs and malt syrup and mix until combined. Add flour mixture; mix on low until combined. Divide into thirds, wrap each in plastic and chill 1 hour. Preheat oven to 350 degrees and line two cookie sheets with parchment paper . Working on a generously floured piece of parchment, roll two of the doughs to just under ¼ inch thick. Transfer dough to lined cookie sheet. Remove from oven and while still warm, gently cut the shapes out with a sharp knife. The cookies will harden as they cool. In the bowl of a stand mixer, with whisk attachment combine the egg whites and vanilla & beat until frothy. Add the confectioners’ sugar and mix slowly until the sugar is combined and the mixture is shiny. Turn speed to high and beat until mixture forms stiff, glossy peaks. This should take approximately 5 to 7 minutes. Transfer icing to a pastry bag fitted with a Wilton Round Tip 5 - seal top to ensure icing is airtight and store in refrigerator. Icing will harden quickly, so keep any remaining icing tightly covered. Note: Only add extract once the mixture has been beaten to stiff peaks - adding the extract any sooner will result in whites not setting. In the bowl of a stand mixer, set over a pot of simmering water (ensuring the bottom is not touching) whisk the egg whites, sugar & cream of tartar just until the mixture is warm to the touch and the sugar is dissolved. Whip on medium-high speed with whisk attachment until stiff peaks form (5-7 minutes). Add peppermint extract and mix to combine. Using a small paint brush, brush stripes of food coloring into the piping bag, fitted with a Wilton Star Tip #4B prior to putting the meringue inside. On a silpat lined baking sheet - pipe small stars of meringue, about the size of a penny. Bake for 1 hour and 15 minutes, turning oven off after this time and letting the meringue cool completely inside the oven (2-3 hours). Store cooled meringues in an airtight container. Preheat the oven to 350 degrees F. Butter two 9-inch x 2-inch round cake pans. Line with parchment paper, then butter and flour the pans. Sift the flour, sugar, cocoa, baking soda, baking powder, and salt into the bowl of an electric mixer fitted with a paddle attachment and mix on low speed until combined. In another bowl, combine the buttermilk, oil, eggs, vanilla and peppermint extract. With the mixer on low speed, slowly add the wet ingredients to the dry. With mixer still on low, add the boiling water and stir just to combine, scraping the bottom of the bowl with a rubber spatula. Pour the batter into the prepared pans and bake for 30-35 minutes, until a cake tester comes out clean. Cool in the pans for 30 minutes, then turn them out onto a cooling rack and cool completely. In the bowl of a stand mixer fitted with a paddle attachment, mix butter until pale and fluffy - 5 minutes. Slowly add the confectioners’ sugar & salt and mix on low to combine - whip on medium high speed until light and fluffy - 7 minutes. Add Vanilla at the very end and mix to combine. Cover and set aside. While cakes cool - assemble Gingerbread House. Starting with one side of the house flat on a work surface, pipe a generous line of royal icing down the side and affix a the two peaked roof panel and using a heavy can to prop let dry for about 5 minutes. Once dry, affix the remaining side of the house in the same fashion. Let dry for 5 minutes. Now you should have 4 walls held together. Working one side at at time pipe windows and doors onto the three sides (front and two sides). I left the back with no windows. Let dry for 5 minutes. Continuing to use the royal icing as glue - affix the roof panels to the house. Allow to dry for 10 minutes. Once dry, affix pieces of peppermint bark to the roof, again, using the royal icing as glue. Set house aside. To make chimney, cut two small rectangles from the baked cookies and glue together with royal icing. Pipe icing in decorative fashion around the chimney - allow to dry and then affix to the roof. At peak of roof, affix peppermint meringues with a small bit of royal icing. To assemble the cake - place on one cake stand or round cardboard cake base. Add ⅓ of the frosting on top and then place the next layer. Use another ⅓ of the frosting to crumb coat the cake with a thin layer. Place in the freezer for 10 minutes to allow frosting to set. When frosting is set, frost entire cake with remaining frosting. 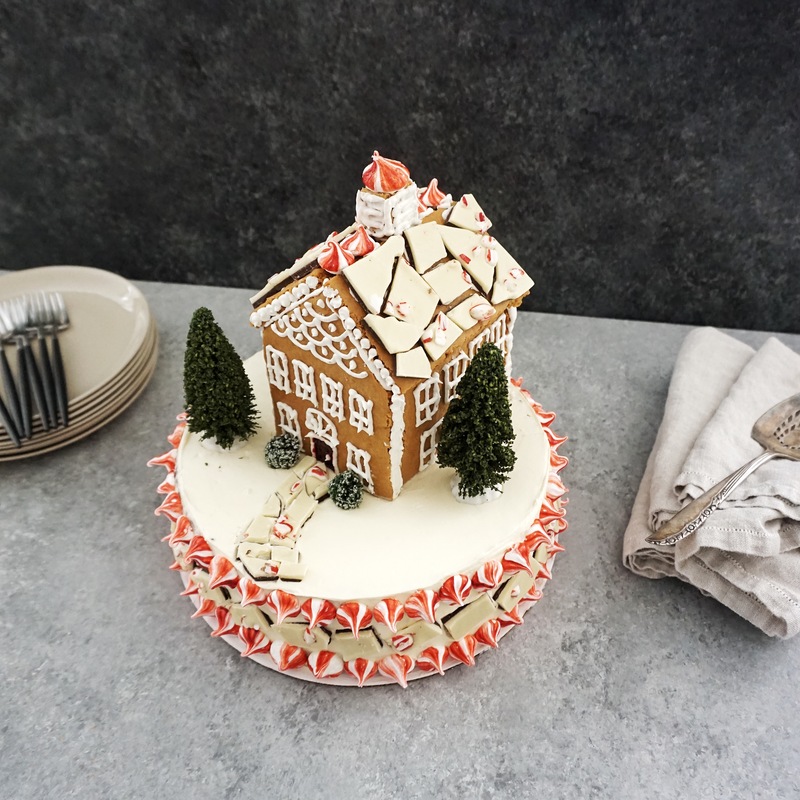 Gently place the gingerbread house on top of the cake to make a light imprint of the footprint of the house - using about 6 or so toothpicks, or other small skewers cut down to size, insert into cake around the perimeter of the house - this will support the weight of the house on the cake. Using peppermint bark create a walkway to the edge of the cake - line cake sides with two rows of peppermint meringues. Optional - use artificial trees and bushes to bring the scene to life! This post was sponsored by TheFeedFeed & Williams-Sonoma. All opinions are my own.